Reading Champion offers independent reading books for children to practise and reinforce their developing reading skills. Fantastic, original stories are accompanied by engaging artwork and a reading activity. Each book has been carefully graded so that it can be matched to a child's reading ability, encouraging reading for pleasure. Independent Reading Pink 1B stories are perfect for children aged 4+ who are reading at book band 1B (Pink) in classroom reading lessons. 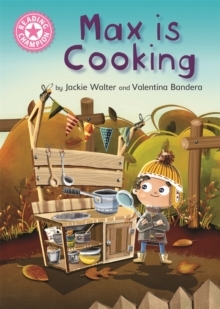 In this story, Max is cooking in the mud kitchen. But will anyone want to try it?